Shirley Jackson’s The Sundial, reviewed. Shirley Jackson’s funny, eerie thriller The Sundial. The following is Victor LaValle’s foreword to a new edition of Shirley Jackson’s The Sundial, out now from Penguin Classics. In 2007 my girlfriend and I went to see the latest Coen brothers film, No Country for Old Men, at a movie theater near Union Square in New York. The place was jammed, but we got decent seats. We’d been dating for a year by that time. Emily and I knew each other pretty well, but it had still been only a year, and it occurred to me, and I’m sure to her, that you could spend that long dating someone and still not know her, understand her, on some essential level. You’re enjoying your days together but also waiting for that moment when you see a flash of the soul, the person’s true essence, so you can decide if this relationship is truly serious. I wasn’t thinking about this stuff consciously as the lights dimmed and the movie started, but it was there in the atmosphere of our relationship. Time to get serious or get gone. Then the predawn imagery of Texas—rough, lovely open country—appeared on the screen. Tommy Lee Jones spoke in a voice-over as the images played on. (“I was sheriff of this county when I was 25 years old.”) The audience, Emily and I included, grew quiet. Toward the end of this astounding film Tommy Lee Jones, who has been playing a weary old lawman, sits at the kitchen table of his home with his wife. By this point No Country for Old Men has morphed from a riveting crime drama into a parable about death, the one inescapable fate. Death in one form or another finds whomever it pleases in the film, and it will not be reasoned with, escaped, or outgunned. By the time Tommy Lee Jones sits in that kitchen his weariness seems well earned. His character has hoped that his earnestness, his competence, his goodness will spare him the destiny that has come for so many others. He tells his wife about two dreams he’s had the night before. The second one is both chilling and resigned. The lawman finally grasps that the end will come for him, as it did for his father, as it does for every woman and man. While Tommy Lee Jones was reciting these dreams, I found my eyes drawn away from the screen for a moment. Something was moving through the theater. I looked to my left, and there I saw a boy, probably 9 or 10 years old. He looked tall, but that was just because he was very thin. He had the reddish brown skin and large eyes of an Ethiopian, that striking beauty that can seem almost otherworldly in certain contexts. Certain contexts like right then in that dark theater. The boy walked up the aisle, scanning the room. His head swiveled left and right. His large, bright eyes seemed to pan across every face in the theater. All the while Tommy Lee Jones’s voice thundered on about his spectral dreams. Emily, to my right, must have noticed my distraction. She inched forward in her chair. She was looking at this boy now too. Her instinct was to help him. She guessed, as I did, that he must’ve been looking for his seat in the dark, scanning for the empty chair where he’d probably just been sitting with his parents. But what parents would bring their 9- or 10-year-old boy to a Coen brothers movie? Especially this one. The boy’s age made him seem as out of place as his appearance made him seem from another world. I looked up at the screen and Tommy Lee Jones had finished his speech and now he sighed and his eyes looked wet with the sudden knowing of what his second dream meant. At that moment Emily raised her left hand to wave to the boy, the one scanning all our faces with those impossibly bright eyes. But I grabbed her hand and pushed it back down onto the handrest. “Don’t call to him,” I whispered. I knew she couldn’t understand, and yet I said it. Emily looked at me in the dark. Our faces were only slightly visible in the light cast by the movie screen. She narrowed her eyes. “Because he’s death?” she said. It’s the moment I knew Emily would be my wife. So why did I just tell you that anecdote? I’m trying to relate what it felt like the first time I read Shirley Jackson’s fiction. What it feels like each time I’ve read her work since. I didn’t grow up in a small New England town like the one in The Sundial. I was raised in an apartment building in Queens, not in a sprawling, slightly sinister mansion like the one where the Halloran family resides. And the LaValles sure didn’t have some storied patriarch whose name we uttered like a prayer, as the Hallorans so often do in this book. And yet when I open The Sundial, I feel the same sense of kinship, of recognition as I did in that movie theater when my soon-to-be wife seemed to read my mind. The Sundial shares some of the characteristics of Shirley Jackson’s most famous works of fiction. There’s the enormous, imposing estate, as in The Haunting of Hill House; the once great but now diminished family, as in We Have Always Lived in the Castle; and even the doom-laden atmosphere of her classic short story “The Lottery.” So what makes The Sundial stand out? Why is it worth reading? Because The Sundial is funny as hell. This may surprise some readers. An eerie work of suspense by one of the great American masters of literary unease couldn’t also make you laugh so loud you wake your sleeping wife, could it? If you accept the caveat that by funny I don’t mean “light” or “silly” or “cheerful,” then the answer is an easy yes. The Sundial is written with the kind of humor that would make a guillotine laugh. The novel begins, after all, with the family returning from a funeral for Lionel Halloran, the heir to the Halloran estate and all its fortune. Lionel was pushed down the main stairs in the mansion and fell down dead. Who did the ghastly deed? His own mother. As the extended family returns home, here’s the conversation between Lionel’s widow and the couple’s 10-year-old daughter, Fancy. “Yes, mother.” Fancy pulled at the long skirt of the black dress her grandmother had put on her. I’m not spoiling anything by quoting this horrifically hilarious exchange because it occurs in the first two paragraphs of the book! In that moment I imagine Jackson peering over those round-framed glasses in her famous author photograph, her eyes gleeful, because things are going to get so much worse. The Hallorans, and their extended hangers-on, become a kind of cult when one of them, Aunt Fanny, receives prophetic messages from her long departed, much revered father. He has appeared to his only daughter to warn that the world is soon to end. All those in the Halloran home must prepare for the coming doom. Shut the doors and windows, close themselves off from the cursed world. Prepare to become the last of the human race. In quick time the family members are drawn into paranoia and conspiracy. They come to believe the prophecy. They have been chosen to inherit the earth. Jackson proceeds to illustrate, in rich detail, just how sad such a fate would be. The whole world ends, and this is all that’s left? Jackson spares no one her precise, perceptive eye. Sadder still is how much I recognize myself, from my worst moments, in one character or another. What saves me from despair is Jackson’s wit, her deadpan demolition of human foibles. For me, that kind of reading experience is essential, and when I discovered Shirley Jackson, it was as if she’d understood what I wanted, what I needed, and set it all down on the page long before I was even born. That recognition is profound, life changing, whether it comes in a darkened movie theater or between the covers of a novel. 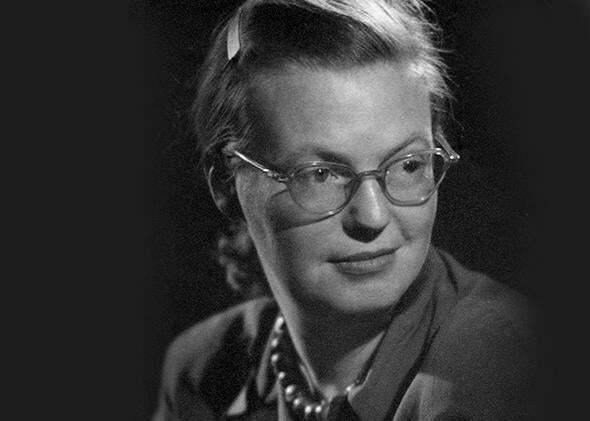 Shirley Jackson enjoyed notoriety and commercial success within her lifetime, and yet it still hardly seems like enough for a writer so singular. When I meet readers and other writers of my generation, I find that mentioning her is like uttering a holy name. The grins we share. The blush of reverence. She doesn’t appear to us in prophetic dreams but in her books. The Sundial by Shirley Jackson. Penguin Classics. Reprinted by arrangement with Penguin Books, a member of Penguin Group (USA) LLC, A Penguin Random House Company. Foreword copyright © Victor LaValle, 2014.